for cashier. Apply in person at X Stop 4900 Highway 311. No phone calls. needs cashier, cooks, and sandwich maker. Call 985-856-1499 ask for John. part-time collection person for finance company. 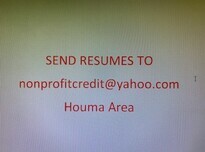 Call 985-872-4340 for interview.